As we have mentioned last week that minor support for the stock lies in the zone of 672 to 675. Support for the stock lies in the zone of 650 to 655 where Fibonacci levels and medium term moving averages are lying. 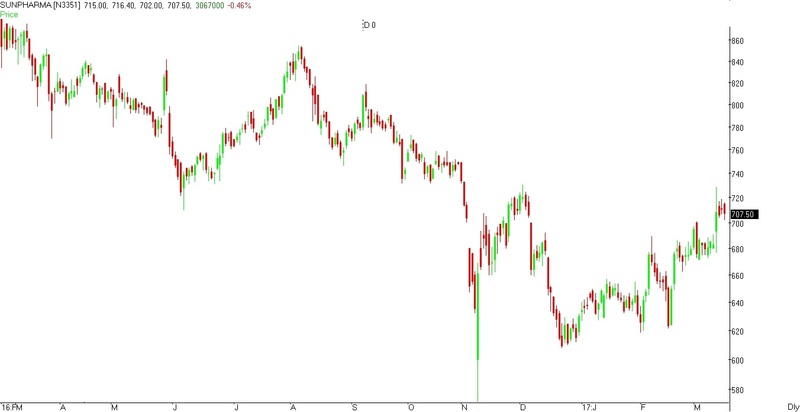 If the stock manages to close below these levels then the stock can drift to the levels of 620 to 625 where the stock has taken multiple supports. During the week the stock manages to hit a low of 677 and close the week around the levels of 708. Minor support for the stock lies in the zone of 695 to 700. Support for the stock lies in the zone of 680 to 685 from where the stock broke out after consolidation. If the stock manages to close below these levels then the stock can drift to the levels of 660 to 665 where short & medium term moving averages are lying. Resistance for the stock lies in the zone of 720 to 725 where trend-line joining lows of 704 & 710 and 200 Daily SMA is lying. If the stock manages to close above these levels then the stock can move to the levels of 750 from where the stock sold off in the month of November-2016. Broad range for the stock in the coming week can be 680 – 685 on lower side & 730 – 735 on upper side.